Approximately 10% to 15% of people with multiple sclerosis (MS) are diagnosed with primary progressive MS (PPMS), in which there is worsening disability in the absence of preceding relapses.1 Many others with relapsing-remitting MS (RRMS) will eventually enter a phase of worsening disability independent of clinical relapses or MRI changes, referred to as secondary progressive MS (SPMS). Collectively, PPMS and SPMS are referred to as progressive MS (PMS). Since the turn of the millennium, multiple highly effective treatments for RRMS have been approved, including oral immunomodulators and infused monoclonal antibody therapies. In contrast, only 2 medications have Food and Drug Administration (FDA) approval for treating progressive MS. Effective treatment for PMS remains an unmet need. Both immunomodulators and neuroprotective agents are being evaluated and are discussed in this review (Figure). Figure. Therapies in use and under investigation for progressive multiple sclerosis are immunomodulators or neuroprotective agents with a variety of mechanisms of action as shown here. Although detailed summaries of the negative trials of interferon β (IFN β) for PMS6,7 are beyond the scope of this review, a discussion of IFN-β trials provides some insight into the limitations of using immunomodulators to treat people with PMS. A European trial of IFN β-1b for SPMS demonstrated a delay in time to confirmed disability progression (CDP), compared with placebo, which was not replicated in a North American trial of IFN β-1b for SPMS.8,9 Post-hoc analysis suggests the discrepancy was a consequence of younger age, shorter disease duration, higher relapse frequency, and higher prevalence of GELs in participants of the European study compared with the North American trial.10 Another trial demonstrated statistically significant reduction in MSFC scores in patients receiving weekly intramuscular IFN β-1a, but no difference in EDSS scores.3 The outcomes of these trials are highlighted, because they foreshadowed 2 themes in clinical trials directed at treating PMS. First, a positive outcome is typically associated with a younger study population with more inflammatory disease and a shorter disease duration and second, preservation of upper extremity function and cognition appear more attainable than preventing decline of ambulatory function or worsening EDSS score. Mitoxantrone is an anthracenedione initially developed for treating malignancy that was also FDA-approved for the treatment of both RRMS and PMS. Although it is rarely used now because of severe risks associated with treatment, it is 1 of only 2 on-label medications for PMS. Mitoxantrone was studied in a phase 3, placebo-controlled trials of 194 participants, half who had SPMS and half who had RRMS with progression between relapses.11 All were randomly assigned to receive placebo or mitoxantrone (5 mg/m2 or 12 mg/m2) intravenously every 3 months for 24 months. The primary outcome was multivariate analysis of 5 clinical measures: EDSS change over 24 months, ambulation index changes, number of treated relapses, time to first relapse, and changes in standardized neurologic status. Statistically significant improvements on the composite and individual test scores were seen with mitoxantrone compared with placebo for the monthly 12 mg/m2 dosage regimen. Unfortunately, side effects limit the use of this medication in practice. Nausea, alopecia, urinary tract infections, secondary amenorrhea, leukopenia, and transaminase elevations were all noted in the phase 3 trial. Even more concerning, a postmarketing report estimated the incidence of systolic dysfunction at 12%, congestive heart failure at 0.4%, and leukemia at 0.8% after mitoxantrone treatment for MS.12 The FDA added a “black-box” warning about these side-effects 5 years after the approval, and since then MS practitioners have all but abandoned use of the medication. Ocrelizumab is a humanized monoclonal antibody to CD20, an epitope predominantly expressed by B lymphocytes. It was FDA approved for the treatment of PPMS based on results of a double-blind, placebo-controlled randomized clinical trial evaluating efficacy in patients with PPMS.13 The primary endpoint was 12-week CDP, measured by EDSS. A key secondary endpoint was the MSFC, which evaluates ambulation, upper extremity function, and cognition. A modest, but significant reduction in the proportion of patients reaching 12-week CDP was observed in patients treated with ocrelizumab compared with those treated with placebo (32.9% vs 39.3%, relative risk reduction 24%, P = .03). Ocrelizumab similarly reduced the proportion of patients reaching 24-week CDP (29.6% vs 35.7%, relative risk reduction 25%, P = 0.04). Ocrelizumab decreased the rate of worsening on the T25FW test and risk of upper extremity function worsening, as measured by 9HPT, the latter of which was explored in further detail in post hoc subgroup analysis.14 Ocrelizumab treatment led to significant reduction in brain atrophy and a modest decrease in T2-lesion volume. Infusion reactions with ocrelizumab were common, but easily managed. Ocrelizumab, like other anti-CD20 therapies, is associated with increased risk of upper respiratory infections, herpes viral infections, and reactivation of hepatitis B. An imbalance in the rate of malignancy was observed but will require longer-term safety monitoring to fully address. Neoplasms were reported in 2.3% of patients treated with ocrelizumab (including 4 patients with breast cancer) as compared with 0.8% in the placebo group. Although ocrelizumab achieved both primary and multiple secondary outcomes, study design—patient selection—may limit the ability to generalize the findings to all patients with PMS. The ocrelizumab trial limited enrollment to persons age 18 to 55 with relatively short disease duration and an elevated immunoglobulin G (IgG) index or unique CSF oligoclonal bands. A high proportion of those in the study exhibited GELs (27.5% in the ocrelizumab group, 24.7% in the placebo arm). Although the prevalence of enhancing lesions was similar to that seen in a trial of rituximab (24.5%), it was considerably higher than earlier negative trials in PPMS with glatiramer and fingolimod (14.1% and 13%, respectively).15-17 The high prevalence of inflammatory disease may have contributed to the positive outcome of the trial. Siponimod, a selective sphingosine-1-phosphate1,5 receptor modulator, is under review for approval for treatment of patients with SPMS following completion of a phase 3 study in which 1,651 persons with SPMS were randomly assigned (2:1) to receive siponimod or placebo for 3 years or until a prespecified number of participants reached 3-month CDP, as determined by EDSS.18 The study population was fairly representative of SPMS, with the majority needing mobility assistance and more than 75% not having had a clinical relapse for a year prior to enrollment. At baseline, however, 21% of them had contrast-enhancing lesions. Siponimod decreased the disability progression risk with 26% reaching 3-month CDP compared with 32% of those receiving placebo (relative risk reduction 21%, P = .013). Although a similar reduction in the risk of 6-month CDP was observed in persons treated with siponimod, no benefit was seen in measures of worsening ambulatory dysfunction, as measured by T25FW. Study authors attributed the lack of statistically significant effects on ambulation to high variability of the measurement in participants with more pronounced disability. Subgroup analysis suggests that persons with relapses in the preceding 2 years or rapid progression had the most relative risk reduction. The effect of siponimod on disability progression was less pronounced in patients with increasing age, disability, disease duration, or less evidence of inflammatory disease. The adverse event profile of siponimod was similar to fingolimod, with increased rates of lymphopenia, elevated liver enzymes, bradycardia, macular edema, hypertension, varicella zoster reactivation (including a case of meningitis), and a higher rate of seizures (2%) in those who received siponimod. Ibudilast is a small molecule inhibitor of phosphodiesterase-4 and -10 with pleiotropic immune effects. In a trial for patients with RRMS, ibudilast did not prevent development of new lesions, but did decrease brain atrophy and conversion of enhancing lesions to black holes.19 In a trial for patients with PMS, 255 persons were randomly assigned to receive ibudilast or placebo for 96 weeks.4 Just over 50% of the participants had a diagnosis of PPMS and the rest had SPMS. Less than one-third of participants were taking immunotherapy in the form of an injectable DMT (use of other immunotherapies excluded participants). The primary endpoint was brain atrophy progression measured by brain parenchymal fraction. Secondary endpoints included other imaging markers, ocular coherence tomography (OCT) measurement of retinal nerve fiber layer thickness (used to assess optic nerve injury), and 20-week disability progression measured by EDSS. Patients treated with ibudilast had a 48% reduction in brain atrophy that the authors point out was superior to ocrelizumab, siponimod, and simvastatin in other trials. The only statistically significant effects of ibudilast on other imaging outcomes were cortical thickness and magnetization transfer ratio; however, effect size was reported without corrections for multiple other comparisons. There was no statistically significant effect on disability progression and patients treated with ibudilast had higher rates of gastrointestinal symptoms (particularly nausea, diarrhea, and abdominal pain), depression, and headache. Interestingly, the placebo group demonstrated higher rates of upper respiratory infection, skin infection, and pain, suggesting a potential treatment effect for MS-related pain. A third study showed no effect of high-dose pharmaceutical grade biotin (MD1003) on vision in patients with MS-related optic neuropathy.22 In a placebo-controlled randomized trial of MD1003, reversal of disability or 20% improvement in EDSS score at both 9 and 12 months was seen in 12.6% (13/103) of those treated with 100 mg MD1003 given 3 times per day compared with none who received placbo.23 Subgroup analysis suggested that persons with a lower baseline EDSS were more likely to respond. After the 12-month placebo-controlled phase, all 154 participants received high-dose biotin in an extension phase. As further evidence of a treatment effect, 11.9% of those who were given placebo in the blinded phase had reduced disability in the extension phase. Relapse rates were similar for those receiving MD1003 (4.9%; n = 5) and placebo (7.8%; n = 4). New T2-weighted lesions and gadolinium enhancing lesions were observed more frequently in patients treated with MD1003, although this did not reach statistical significance. A clinical trial was subsequently begun to specifically address concerns about potential increased risk of relapses with off-label use of high-dose biotin in patients with MS. Additional safety concerns from this study included interference with a number of common laboratory tests, most notably thyroid testing. Other clinical laboratory testing likely to be affected by high-dose biotin treatment includes vitamin D, troponin, and pituitary hormone levels.24 A larger phase 3 study of MD1003 is underway. Lipoic acid is an endogenous organosulfur compound with putative antioxidant effects being evaluated for treatment of PMS based on hypothetical neuroprotective effects and promising data from preclinical studies. A pilot study suggested that lipoic acid was well tolerated and resulted in reduction of relevant serum markers in patients with MS.25 In a subsequent phase 2 controlled trial, 54 participants with SPMS were randomly assigned to receive lipoic acid or placebo for 2 years.26 The primary endpoint of the study was percent change in brain volume, a measure of brain atrophy. Secondary endpoints included rates of atrophy in segmented brain, spinal cord, and retina (as measured by OCT), as well as change in disability, quality of life measures and safety. Patients treated with placebo had a 68% reduction in brain atrophy but not in segmented brain, spinal cord, or retina (measured by OCT). Changes in disability levels, quality of life measures, or safety were also not observed although there were fewer falls and a trend toward improvement of T25FW in those who took lipoic acid. An increase in gastrointestinal upset was seen for people taking lipoic acid and 2 developed renal injury, including one with renal failure and the other with proteinuria from glomerulonephritis. A trend toward increased T2 lesion volume was seen in those treated with lipoic acid, although only a single relapse occurred in either arm. A larger phase 2 studya to evaluate the safety and efficacy of lipoic acid is currently recruiting with a goal of enrolling 118 participants to either 2 years of 1200 mg lipoic acid or placebo daily; this study has a primary endpoint of improvement in T25FW, with secondary endpoints including 2-minute timed walk, change in falls, and brain atrophy. Simvastatin is an HMG-CoA reductase inhibitor that is indicated for treatment of hyperlipidemia and for secondary prevention of cardiovascular disease. A clinical trial evaluating simvastatin for treatment of PMS was designed based on scientific evidence of anti-inflammatory and cell protective effects.27 In this trial, 140 people with SPMS were randomly assigned to receive 80 mg simvastatin or placebo daily. The primary endpoint was annualized rate of whole brain atrophy, with additional imaging secondary endpoints, including the number of new or enlarging T2 lesions. Patients treated with simvastatin had a 43% reduction in brain atrophy and improvement in EDSS. A non-significant trend was seen for improvement in MSFC and reduction of T2 lesion accumulation. No differences were observed in relapse frequency or inflammatory expression profiles. A larger phase 3 study evaluating simvastatin for PMS is recruiting enrollees in the United Kingdom and Ireland, with an anticipated enrollment of nearly 1,200 participants and a planned primary outcome of time to CDP, as measured by EDSS, with secondary endpoints including measures of ambulatory ability, upper extremity function, cognition, relapse rates, and measures of cost effectiveness. The majority of patients diagnosed with MS will eventually enter a progressive disease phase. At present, ocrelizumab is the only safe treatment available for persons with PMS, and although siponimod may be approved in the near future for SPMS, these medications are modest in their effects, and an unmet need remains. Furthermore, much of the treatment effect from ocrelizumab and siponimod is attributable to decreased inflammation, which favors younger patients with shorter disease duration. Such patients represent a fraction of those with PMS, making these results difficult to generalize to real-world patient populations. Older patients with decreased mobility are likely more susceptible to infectious complications, which shifts the risk-benefit ratio in a way that warrants careful patient selection. There are reasons to be optimistic about filling the unmet need of preventing disability for persons with PMS, including patients who may not be ideal candidates for an effective immunomodulator. A number of agents with putative neuroprotective effects have shown promise in recent clinical trials. Biotin, lipoic acid, and simvastatin are all medications that have demonstrated a benefit in progressive MS that are available for off-label use. While the safety data surrounding simvastatin are readily available, some caution is reasonable with regard to off-label use of lipoic acid and high-dose biotin while awaiting the results of larger clinical trials. Although erroneous laboratory results are an established risk with biotin (including thyroid and troponin testing), data from previous studies also raise concerns about the potential for increased inflammatory activity during treatment. Ibudilast demonstrated a robust effect on brain atrophy, which will hopefully translate into prevention or reversal of disability progression in an adequately powered study. a. Lipoic acid for progressive multiple sclerosis (MS)(NCT 03161028). 1. Lublin FD, Reingold SC. Defining the clinical course of multiple sclerosis: results of an international survey. Neurology. 1996; 46(4):907-911. 2. Kurtzke JF. Rating neurologic impairment in multiple sclerosis: an expanded disability status scale (EDSS). Neurology. 1983; 33(11):1444-1452. 3. Cohen JA, Cutter GR, Fischer JS, et al. Benefit of interferon β-1a on MSFC progression in secondary progressive MS. Neurology. 2002; 59(5):679-687. 4. Fox RJ, Coffey CS, Conwit R, et al. Phase 2 trial of ibudilast in progressive multiple sclerosis. N Engl J Med. 2018;379:846-855. 5. Barro C, Benkert P, Disanto G, et al. Serum neurofilament as a predictor of disease worsening and brain and spinal cord atrophy in multiple sclerosis. Brain. 2018;May 30. doi:10.1093/brain/awy154. 6. Baldassari LE, Fox RJ. Therapeutic advances and challenges in the treatment of progressive multiple sclerosis. CNS Drugs. 2018;78(15):1549-1566..
7. De Angelis F, Plantone D, Chataway J. Pharmacotherapy in secondary progressive multiple sclerosis: an overview. CNS Drugs. 2018;32(6):499-505. 8. Kappos L, Polman C, Pozzilli C, et al. Final analysis of the European multicenter trial on IFNβ-1b in secondary-progressive MS. Neurology. 2001;57(11):1969-1975. 9. Panitch H. Interferon beta-1b in secondary progressive MS: results from a 3-year controlled study. Neurology. 2004;63(10):1788-1795. 10. Kappos L, Weinshenker B, Pozzilli C, et al. Interferon beta-1b in secondary progressive MS: a combined analysis of the two trials. Neurology. 2004;63(10):1779-1787. 11. Hartung HP, Gonsette R, König N, et al. Mitoxantrone in progressive multiple sclerosis: a placebo-controlled, double-blind, randomised, multicentre trial. Lancet. 2002;360:2018-2025. 12. Martinelli Boneschi F, Vacchi L, Rovaris M, et al. Mitoxantrone for multiple sclerosis. Cochrane Database Syst. Rev. 2013;5:CD002127. 13. Montalban X, Hauser SL, Kappos L, et al. 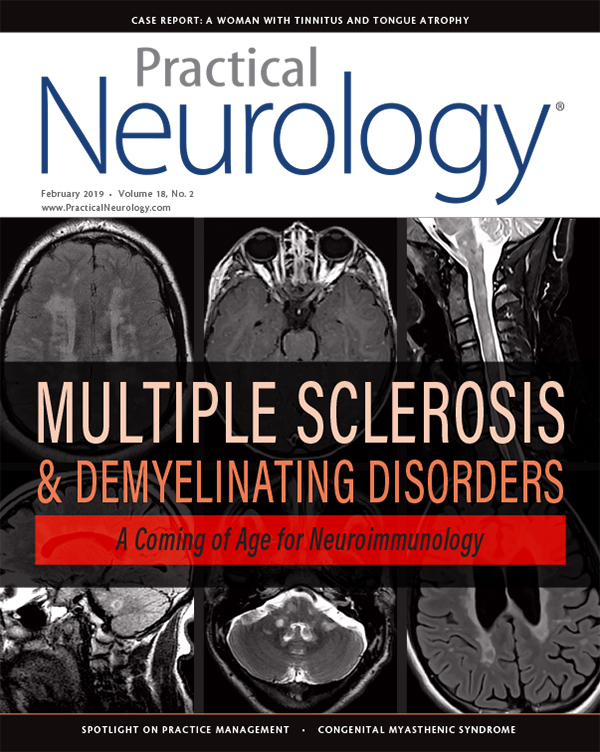 Ocrelizumab versus placebo in primary progressive multiple sclerosis. N Engl J Med. 2016;376:209-220. 14. Fox E, Markowitz C, Applebee A, et al. Effect of ocrelizumab on upper limb function in patients with primary progressive multiple sclerosis (PPMS) in the oratorio study (ENCORE). J Neurol Neurosurg Psychiatry. 2018;23(3S):427-679. 15. Hawker K, O’Connor P, Freedman MS, et al. Rituximab in patients with primary progressive multiple sclerosis: Results of a randomized double-blind placebo-controlled multicenter trial. Ann Neurol. 2009 ;66(4):460-471. 16. Wolinsky JS, Narayana PA, O’Connor P, et al. Glatiramer acetate in primary progressive multiple sclerosis: Results of a multinational, multicenter, double-blind, placebo-controlled trial. Ann Neurol. 20017;61(1):14-24. 17. Lublin F, Miller DH, Freedman MS, et al. Oral fingolimod in primary progressive multiple sclerosis (INFORMS): A phase 3, randomised, double-blind, placebo-controlled trial. Lancet. 2017; 387(10023):1075-1084 . Erratum in 389(10066):254. 18. Kappos L, Bar-Or A, Cree BAC, et al. Siponimod versus placebo in secondary progressive multiple sclerosis (EXPAND): a double-blind, randomised, phase 3 study. Lancet. 2018;391:1263-1273. 19. Barkhof F, Hulst HE, Drulović J, et al. Ibudilast in relapsing-remitting multiple sclerosis: a neuroprotectant? Neurology. 2010;74 (13):1033-1040. 20. Sedel F, Papeix C, Bellanger A, et al. High doses of biotin in chronic progressive multiple sclerosis: a pilot study. Mult Scler Relat Disord. 2015;4(2):159-169. 21. Birnbaum G, Stulc J. High dose biotin as treatment for progressive multiple sclerosis. Mult Scler Relat Disord. 2017;18:141-143. 22. Tourbah A, Gout O, Vighetto A, et al. MD1003 (High-Dose Pharmaceutical-Grade Biotin) for the Treatment of Chronic Visual Loss Related to Optic Neuritis in Multiple Sclerosis: A Randomized, Double-Blind, Placebo-Controlled Study. CNS Drugs. 2018;32(7): 661-672. 23. Tourbah A, Lebrun-Frenay C, Edan G, et al. MD1003 (high-dose biotin) for the treatment of progressive multiple sclerosis: A randomised, double-blind, placebo-controlled study. Mult Scler. 2016;22(13): 1719-1731. 24. Li J, Wagar EA, Meng QH. Comprehensive assessment of biotin interference in immunoassays. Clin Chim Acta. 2018;487: 293-298. 25. Yadav V, Marracci G, Lovera J, et al. Lipoic acid in multiple sclerosis: A pilot study. Mult Scler. 2005;22(13): 1640-1641. 26. Spain R, Powers K, Murchison C, et al. Lipoic acid in secondary progressive MS: A randomized controlled pilot trial. J Neurol Neuroimmunol Neuroinflammat.2017;4(5):e374. 27. Chataway J, Schuerer N, Alsanousi A, et al. Effect of high-dose simvastatin on brain atrophy and disability in secondary progressive multiple sclerosis (MS-STAT): A randomised, placebo-controlled, phase 2 trial. Lancet. 2014;383: 2213-2221. MT reports receiving consultancy fees for serving on medical advisory boards for Biogen and Genentech, both manufacturers of treatments for various forms of multiple sclerosis.